Students and parents, welcome to the Pre-Degree Careers and Enterprise newsletter! This will be a termly newsletter to share with you all of our amazing student opportunities and achievements. This newsletter is packed with info about our achievements from the last year, including case studies and student work from our projects with Applied Automation, Let’s Make it Real, Adelie Branding and Embroidery and MTV Ocean City Sounds. Also included are future opportunities and events. Pre-Degree - Work placement case study. Introducing Erin Reed, Fashion and Textiles Year 2. Erin started work with Adelie Branding and Embroidery, initially on a trial basis of a few weeks. Within 2 days, Erin made a really positive impression within the company. Penny and Peter Ellis owners of Adelie Branding and Embroidery were super impressed by the way Erin committed her time to learning new things and communicated with customers. Her confidence and ability to speak to people in real detail about embroidery, textiles and branding is a real credit to Erin’s work ethic, attention to detail and character skills. Erin intends to progress onto university after completing the Extended Diploma in Fashion and Textiles course, we are sure that her work on her course and with Penny and Peter over the last year will help Erin adapt and flourish in any future employment opportunities. Completed Pre-Degree projects from the past year. MTV Ocean City Sounds: 26th and 27th of July 2018. 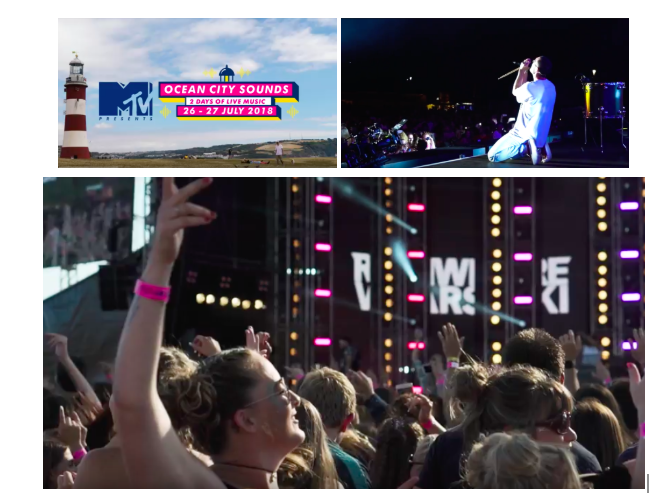 8 of our year 1 students took part in a really cool work placement project at MTV Ocean City Sounds 2018. The students attended the set up and the 2 full days of the festival, producing film, photography and digital content for the Plymouth City Council’s marketing department and MTV OCS social media streams. The students had an amazing experience and produced some really professional work. Thank you to our amazing Film Animation and Media Production tutor Billy Abbott for arranging this opportunity. 21 Pre-Degree year 2 from ED Photography and ED Film, Animation and Media Production students worked with Applied Automation. Applied Automation are leading suppliers of automation and control solutions, systems and products for manufacturing, marine and smart homes with specialist operating divisions. Applied Automation harnessed the imagination of PCA students to provide a set of innovative and alternative solutions to their everyday marketing needs. Our students produced film, photography and digital content to be presented within trade fairs and other industrial events. Two creative media students worked with local employers to make short films, promoting the relevance of maths and English skills for employability. The films illustrate how these skills are essential for solving problems in the workplace and how they are connected to possible career routes for our students. The project involved small independent businesses, Liberty Pearl Photography, Helen Round Contemporary Textiles and Plymouth Art Centre, as well as larger stakeholders in the city such as Devonport Dockyard. Employers were interviewed and filmed in the context of their work, demonstrating how maths and English skills are applied to the everyday running of their business. Using these films as a resource with our students has had a positive impact, by helping them to see how their education links to their future career.